Vivenda 1º andar, e um terraço onde podem desfrutar o sol e a vista para o mar. Possui 3 casas de banho, uma com banheira, outra com duche e o WC. A sala no R/C dá para o pátio, piscina e barbecue onde podem desfrutar de tardes soalheiras. É o destino ideal de férias para relaxar. A praia de Alvor com o seu extenso areal tem a particularidade de dividir o oceano e a ria de Alvor. Alvor é uma aldeia de tradição marítima, com restaurantes típicos de qualidade, o peixe fresco uma riqueza da região é o rei das ementas. A proximidade a Portimão(6 Km) dá-lhe a agitação que necessitar. Animais após acordo com proprietário. Estoy muy contento porque la casa tenía todo lo necesario, y aprovechó sus vacaciones. magnifique maison où rien, absolument rien ne manque. situation idéale pres de la page, de la promenade d'alvor, des commerces et des moyens de transport. vacances merveilleuses et sans souci. Absolutely fantastic villa! Party of 5 adults and a 2 year old stayed for one week. Everything you needed was available, including items for use on the beach (even a bicycle was at hand). Manuela the owner was there to meet us on arrival to show us around - lovely helpful lady. Spacious villa and the pool was a bonus! lovely quiet street but only 3 minute stroll to the centre of Alvor and 10 minutes walk to beach with a toddler. Will definitely return again. Stayed in Alvor on many occasions but this is by far the best accommodation we've stayed in in Alvor! Thanks Manuela. This is a home from home, in fact better!.. 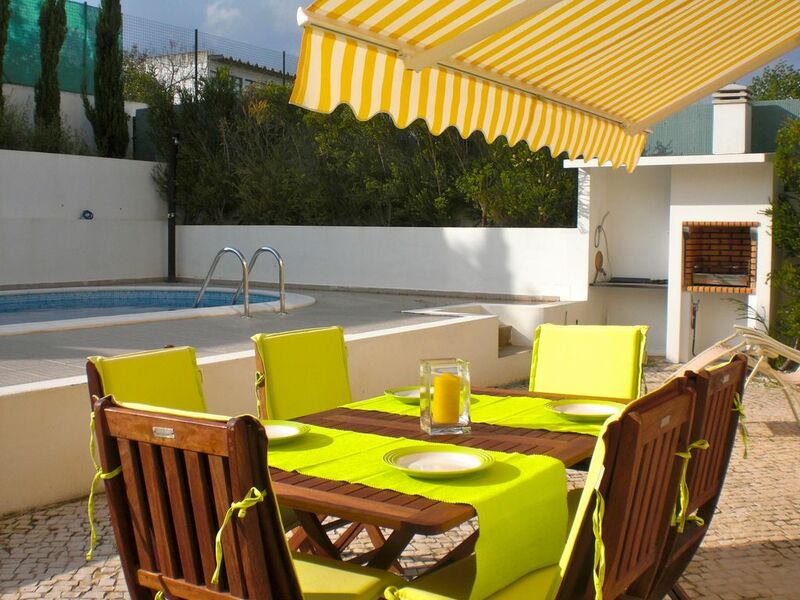 Absolutely immaculate, everything and I mean everything provided, towels, cleaning equipment, fully equipped kitchen, bbq, pool area, 5 mins walk to Main Street and also beach.. Has a roof terrace also to catch the last of the sun.. Would def visit again! I'm so pleased, your holidays are a great sucess. Thank you for your review and your kind works about the villa. My objective is your well-being! My family and I, 5 adults, have had the most amazing holiday, made even more the better by staying in this villa. It is modern, clean, exceptionally well equipped, and is near enough to the centre (3 mins walk) to make it easy to wander into the village, but just far enough away to not be able to hear nightlife after we have had enough! The three bedrooms are large and comfortable, the beds are lovely and fully furnished, with all towels supplied and the most fantastic shower ever. The main bedroom has an ensuite with a large corner bath and a balcony with sea views. The kitchen is wonderful, with a washing machine and dishwasher, you have everything you need if you decide to cook here. Outside, the swimming pool is immaculately clean, and the outdoor BBQ has been amazing for us to cook on during the evening. There is a roof terrace which is perfect for sunbathing as you get the breeze off the ocean. The photos on this website don't do this villa justice, it is so much more than what you can see here. We can't wait to come back, thank you Manuela for a fantastic time, your villa is beautiful. I'm very happy to know that your holidays were great. when the house contribute for that is very good to me. Alvor é uma vila pitoresca muito agradável de tradição marítima com óptimas praias. A moradia localiza-se no centro de Alvor a 200m da praia. Junto à Ria de Alvor, onde encontra os melhores restaurantes de peixe grelhado e marisco a preços acessíveis. Muito próximo encontra também lojas, bares, farmácia, supermercado, complexo desportivo, desportos náuticos, passeios de barco, safari e Golf. Existe ainda o Zoo Marine na Guia e Slide & Splash em Lagoa. O aeroporto de Faro localiza-se a 70km de Alvor, cerca de 50 minutos.